Grayson Perry : The Hogarth of 2017 who says aloud what women only whisper. Grayson Perry: the Hogarth of 2017? I LOVE Grayson Perry. My first sight of his work was at the Turner Prize in 2003. From a distance his pots were exquisite high glazed and somewhat feminine. Up close there was something heartrending about the darkness behind closed doors. 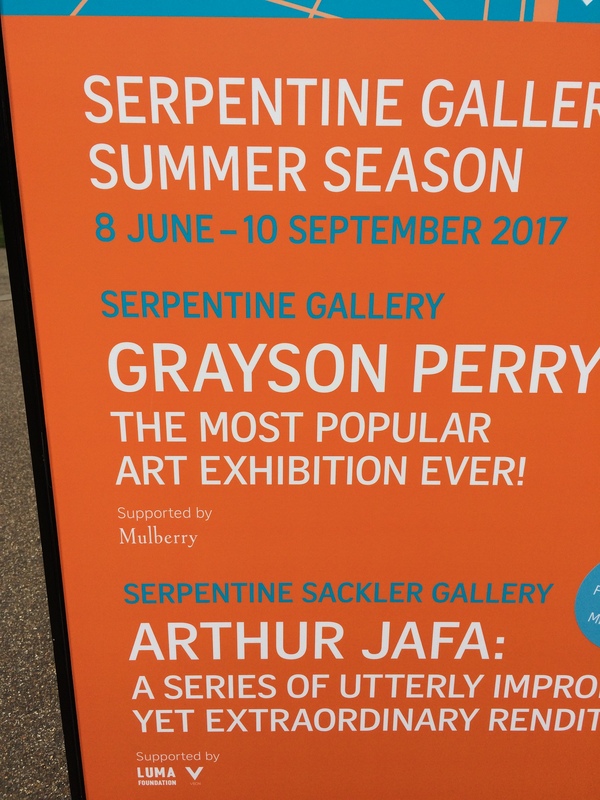 The current exhibition at the Serpentine is free and fascinating. He helps you feel what changes in our society feel like in the post- industrial north. He makes you ask questions. Sometimes I miss reviewing exhibitions. If I had to write about it, I had to focus. It made me see! This artist – like a good novelist- wants you to walk in other people’s shoes ; people from completely different backgrounds to you. He wants you to see what is good in them and what hurts. It is refreshing to read Grayson Perry’s The Descent of Man . Here is a man saying what many women have been saying in whispers . PD James was a customer of mine when I was a director of the Jam Factory. (1988-1998) One day I asked her what she was working on . She replied that this book was different from anything else she had written – Children of Men. Then in a whisper she said ‘ I have been asking myself why men are so violent. ‘ Grayson asks the same question. Why are 90 per cent of violent crimes committed by men? Those violent men ( a minority if a large minority of men) commit their crimes against women, gay people, rivals, foreigners and people who don’t see the world as they see it . It’s about displaying their masculinity – brawn not brain . Grayson is right the underlying problem is about how we define gender . It is a particular problem in religious cultures which segregate and have rigid definitions of the sexes In the meantime I think SPORT ie. substitute warfare is the best outlet for those old hunter warlike instincts men have been taught for thousands of years . Artists and Writers. Grayson Perry our modern day Hogarth and Fielding?